Our main residency currently is the Best Western Premier Hotel Bayerischer Hof in Miesbach, a small Bavarian town which is a 30-minute-drive to the south of Munich. 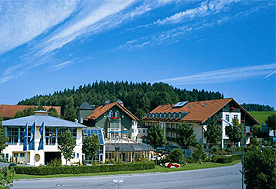 The hotel is located in the midst of the Miesbach Oberland, a majestic, lake-strewn landscape in the foothills of the famous Alps with an impressive panoramic view of the mountains. The hotel is the perfect location and starting point for the game field sites as well as for short or daily adventure or sightseeing excursions. Regular training camps of professional teams of 1st, 2nd and 3rd leagues as well as national youth teams have given the hotel staff extensive experience in the area of professional soccer training camp support. 134 twin/double rooms, suites, and gallery rooms provide your team with all the comfort of a four-star establishment, like TV, telephone, safe, bathroom, shower, lavatory, hair dryer, seat opportunities, working table, minibar (extra payment) and of course an everyday cleaning service. Mostly team coaches choose double occupancy for their players. However, you are welcome to work out special arrangements with us. Head and assistant coaches generally reside comfortably in single rooms or suites to ensure privacy and to give you an even better holiday feeling. To allow your players to show their best performance it is vital to have the right food supply. 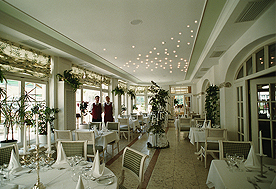 You will enjoy Bavarian gastronomy as well as international gastronomy, usually provided in buffet style. Standard is three meals per day (breakfast, lunch, dinner) with the possibility to takeout lunch packages if you are on the road during the day. Also, we have a great time flexibility when it comes to scheduling each meal which is very helpful if you want to make changes in your short-term planning. The hotel staff makes sure that the buffet provides everything that a soccer player's diet demands. Other than that any meal arrangements can be made. Juice and water for the meals as well as tea and coffee for breakfast are always included. The serving staff is dressed in Bavarian traditional clothing which creates a genuine atmosphere and offers a nice insight into the domestic culture. Directly attached to the hotel is the 5000 m² sport park that offers many extras like a fitness room (1200 m²), indoor tennis, squash, sauna, solarium, vapor bath or a climbing wall. You can use one of the 16 conference rooms for team meetings. Also a trainer's and kit manager's room will be available. The hotel also offers a public computer desk with free internet access and there is wireless internet available. The hotel provides laundry self-service for the teams. Sports Travel Agency can also arrange different accommodation if needed. We have good relations to many other excellent hotels of different price segments at different locations that are very experienced with soccer teams. We would happily work out something for you.